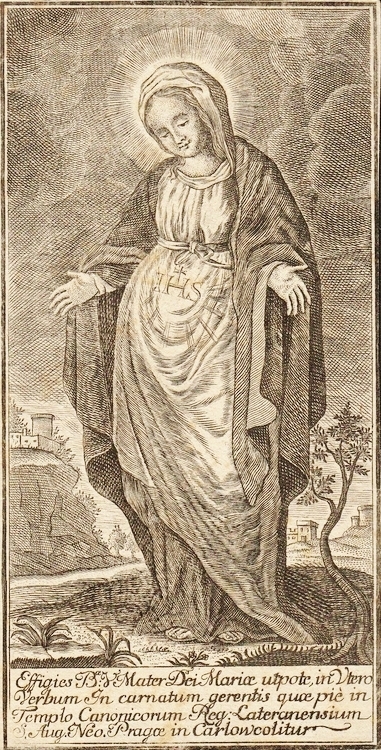 Our Lady of the Expectation | 17th century engraving, Monastery of Canons Regular, Prague. She is with child. The Virgin Mother awaits His birth. We relive the great mystery of the Advent of God in the flesh. The secret to this waiting is not in welcoming a memory of historical events, but in realizing that what happened then happens over and over again still now. We wait, because waiting is inherently a prequel to birth — His birth in the soul of man. Now. You who are astonished at what is wrought in Mary’s body, imitate it in your soul’s innermost chamber. Sincerely believe in God’s justice, and you conceive Christ. Bring forth words of salvation, and you have given birth to Christ. Maternity is baffling. The maternity of the Virgin is incomprehensible, true, by grace and faith believed. That God would desire to come in the flesh is so astounding a reality it changes maternity forever. No longer can the woman, the mother, say she simply brings forth a child. She now can say that the very act of generation has the potential for union with divinity. And nothing would be the same again. The heart fears the uncertain, and yet Bethlehem is now possible everywhere souls search for a place of rest to welcome Christ. He is conceived in souls that fear, in souls that sin, in souls that doubt, and hope to believe. He makes it possible for souls to become human vessels of His life in the world. The heart of the Mother that contemplates the descent of God is the heart of every woman and man whose life is touched by grace. Flickers of grace, that glorious advent light of hope, can spark a fire and set hearts ablaze. Hers must have been such a heart — filled with the glory of the life of God hidden, enfleshed in the stillness of her womb. This is what the silence of the Virgin of the Expectation teaches us. There are no details. And yet the details are as unique as the souls that partake in the Mystery of the Advent of God in the flesh. We shall not know what the heart of His Mother felt in nearing the day of His birth. We shall not know her tears or her joys. We shall simply know that in contemplating the infant in her womb, she shelters the Promised of the Nations. She becomes a new Temple. And we shelter Him now in the same way. He who came into the coldness of our world to dispel darkness, seeks a home in the heart of man now. The innermost chamber must become the Ark of the Covenant still. She is called the Domus Aurea, the House of Gold, because she is the tabernacle He chose for his human coming. And still now, souls who near His Presence, who commune in the feast of His Sacred Body, are given to enshrine Divinity. It seems too good to be true, because it is too good and true. She clung completely to the promise of the one who comes as Lord; holds fast to the root of Jesse, anchored in the fertile inheritance of the prophets and the prayers of the fathers of Israel, and now nourished in her lifeblood. The womb becomes the home of the Redeemer. She conceives Christ firstly in her heart and then in the flesh. She waits for the birth of the long awaited One. She hopes and so sees light. She carries, enfleshed, the Light of the World. And she invites us to contemplate in her contemplation. For He must grow in us as well. He must find a home and welcome here and now. He cannot bear separation from the creation He loves, redeems, saves. He came to save. He comes to save; that what is broken be restored, the lost brought to the stable and see the hope of their wandering hearts. Helpless, indefensible, God, He rests in the poverty of the night to show the world that night is not the final end of day but that the daystar will rise again. How wondrous her poverty. How wondrous her maternity. She has herself alone to give. And this is wealth, abundance, fragrant offering, treasure and joy. Working, eating, sleeping, she was forming his body from hers. His flesh and blood. From her humanity she gave him his humanity. All her experience of the world about her was gathered to Christ growing in her. She gave him his flesh and blood. She prepared the Host for the Mass. Do not disturb the silence of the night. The wondrous takes place in stillness, poverty, prayer. Divinity has contemplated man and found him worthy of great love; loved him to exalt him on high. The sacrifice of descent has been chosen, desired. For the night is fleeting and the Light shall reign. The victory is won. Conceiving Christ we are held up from misery; lowly yet brought high. Amazing things are wrought from the unworthiness of straw strewn mangers that yet receive him. He loves yet and always. He shall come, because we need Him. He shall save. He shall banish night and death. The days are shorter because He is the length of them; fullness in the stillness of our emptiness. Behold the tabernacle of God is with men: and he will dwell with them. This continues a series on maternity. See also Mother of Mine, The Hidden Face of Love, The Common Good of Hidden Maternity, Why I Choose Not to Buy Myself A Child, Procreation is Not For Us. and A Maternal Feast of Thanks.